Welcome to the everlasting summer of amazing food, desserts, and beautiful decor at this West Coast-themed Summer House Santa Monica restaurant in Rockville’s (North Bethesda) Pike & Rose town center right outside of Washington DC. With a first step in and you are greeted by bright summer feel, cookie bar, and the smell of great food. While they have a wide verity food, we predominantly come here for their tasty brunch, because we are the Brunch boys. Regardless of the season at this place its Summer every day. This place is listed as dinar on Yelp, but this is probably the most modern diner I’ve ever been to. Whatever you call yourself, the place is amazing so take my money and food me great nom nom. Every January 1st they host a PJs Brunch where your whole party can get some gift cards/deal on food for wearing some pajamas. Even the staff gets into it and even some wear fun outfits. After a few visits, we can say that this is one of the best restaurants in the metro area. Some DC nomsters might say it too far, well gurl, the place is worth it. Metro Red line is only a few minutes away. Plus an additional bonus there some very cute eye candy working here that gays and girls might appreciate XOXO. We almost never mention the decor or atmosphere of the restaurant, but this place is so beautiful and well decorated that it just needs to be highlighted. One of the brightest, lightest, and beautifully decorated restaurants. This place truly showcases summer without being overbearing. The decor is very simple and clean which this nomster can truly appreciate. Love use of neutral and splashes of bright color. The person that picked every item did an amazing job, actually, can they come and help decorate my place? There is no brunch without an amazing egg dish like these perfectly poached eggs. It takes a lot to impress this nomster as we are big eggs lovers. During this weekend brunch, they didn’t just make a great dish, they raised the game to a new level that not many restaurants will be able to match. 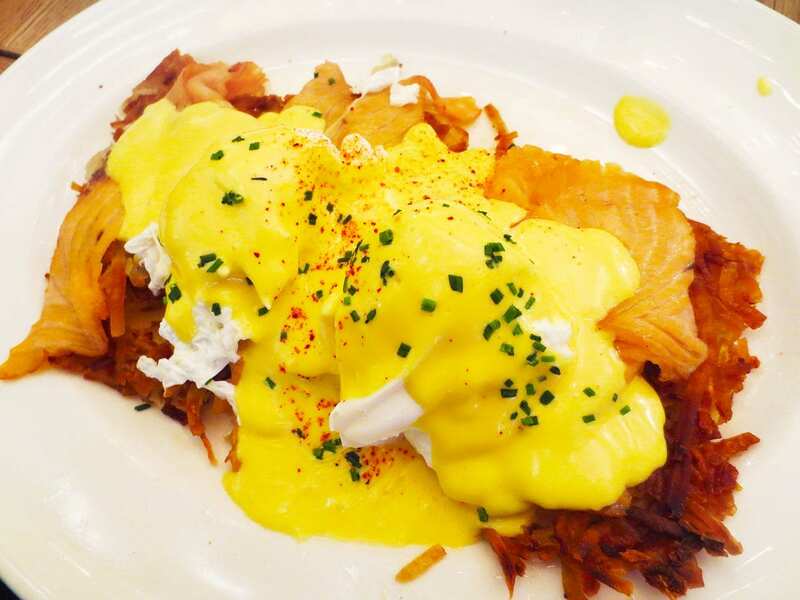 Beautifully prepared runny yoke eggs with light hollandaise sauce on top of thinly sliced grilled salmon and super crunchy hash browns. Every bite of these three strong flavors combined made us very happy nomsters. 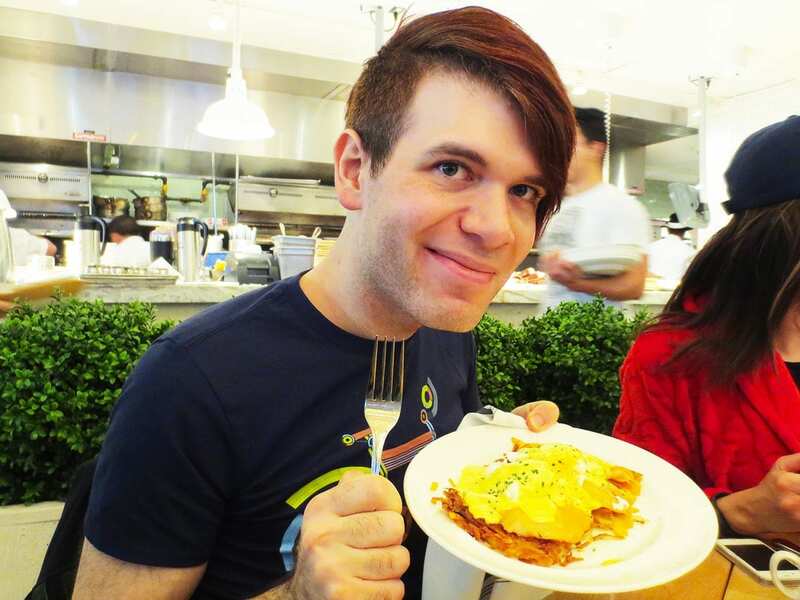 Their hashbrowns are extremely crunchy, but not overcooked so it goes well with the soft texture of everything else. In case salmon is not your thing you can order it with candied bacon. 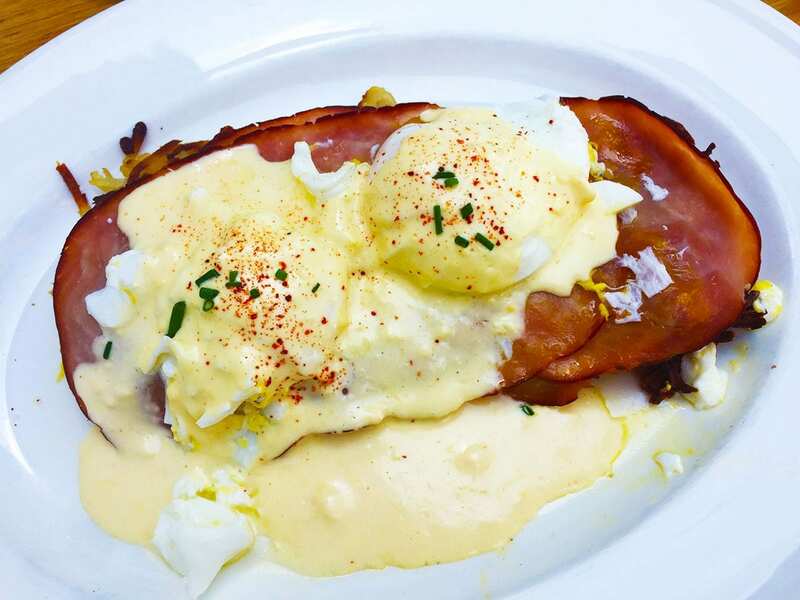 This is probably our brand new favorite place for Eggs Benedict. The minor, little, super tiny thing that I would change is Salmon. It tasted great and we just loved it but could be even better if it was Smoked Salmon instead. We tried our friend’s Smoked Salmon and just fell in love with it. So next time might try and see if they can substitute for some. Still an excellent dish, but could have made it into our special 6 NOMs club of OMG AMAZ-BALLS DISH. price wise this is on the same level with most restaurants, but with such high quality, you are getting far more for $13. 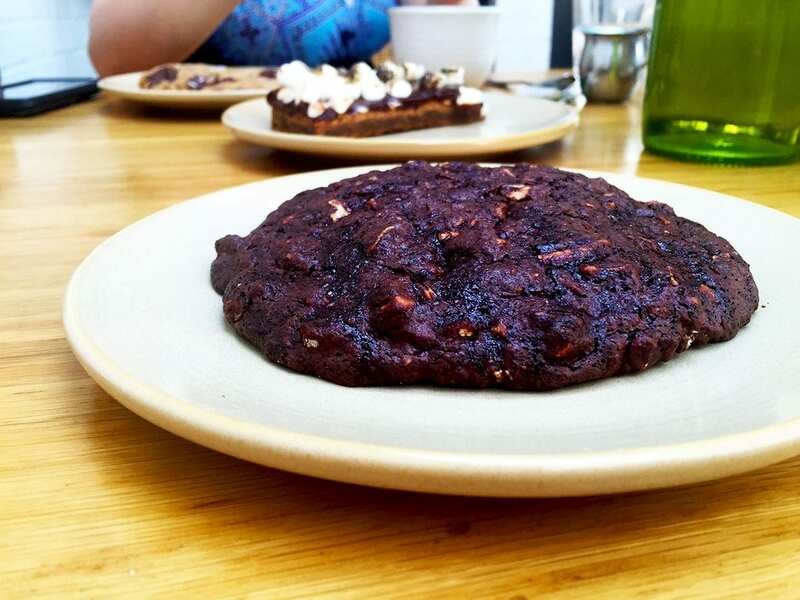 So if you are a brunch-loving hungry nomster then this is a must try for you. Eggs and bacon are best friends forever especially when they are in this brunch noming dish. Ah, yet another amazing dish from the egg masters of Summer House. They sure know how to make an egg lover like me happy! Why would I even order anything else? These eggs were perfectly prepared. Just fell in love with a giant slab of thin pork belly bacon. Not often a restaurant actually gives you a proper amount of bacon goodness. Most would just do like 2 or 3 slices and that’s it. You can’t even see most of the dish because of all the bacon. Nice big eggs with a perfectly runny yolk. After all, this is what the poached eggs are all about. We really enjoyed that their Hallandale sauce wasn’t heavy so it let other ingredients to shine through. We were split between 4 or 5 NOMs, but they get a whole NOM point just for the amount of bacon in this dish. Great value as well for $13 you get a dish that will leave you one happy nomster. Let’s get berry happy with some waffle noming. Is it a dessert or an entree? Who cares this is brunch where breakfast is lunch and lunch is breakfast. Now this large and thick waffle would satisfy any food size queen like us. Comes with an assortment of fresh berries, whip cream on top and Vermont maple syrup. While they are nice and thick, they are still very soft and don’t require the whole bunch of syrup just to swallow it. After all, it’s great to swallow when eating something so big ;). 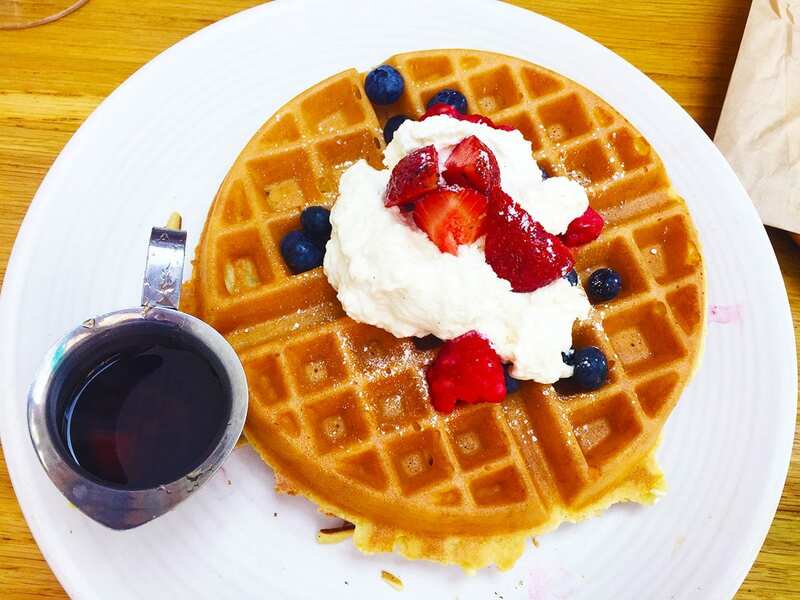 For a waffle dish its enough to share with a friend so you can order a few other things. After all $11 price tag makes it a good and low price dish to share or eat all by yourself. The dessert bar is far better than alcohol bar when it has so many gluten-free cookies. 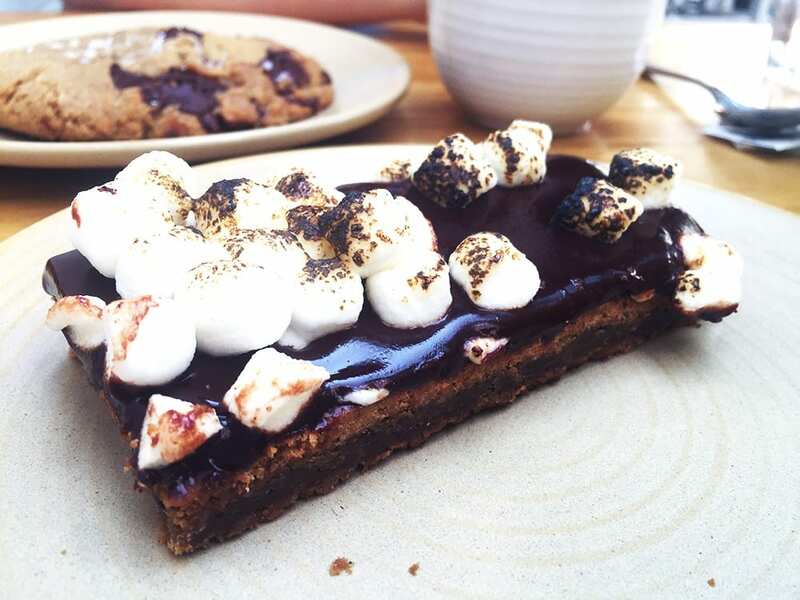 You heard it right, they have a bar just for desserts here and it’s fully stocked with sweet goodies like cookies, s’more bars, and so much more. 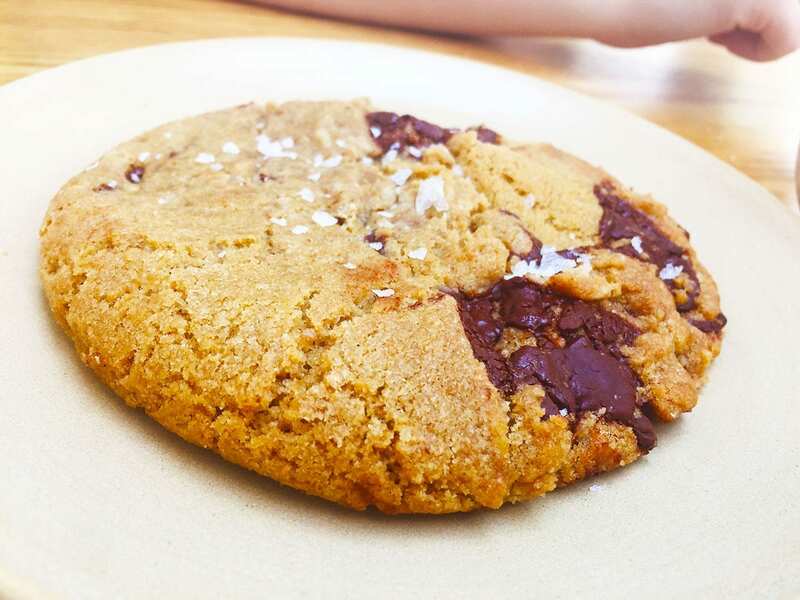 We are big fans of these big cookies with their crunchy, gooey and sweet flavors. So many different choices that you might just feel like a kid at cookie store. We went for Chocolate Walnut and Chocolate Chip because chocolate is always great. Since they are gluten free that means we can enjoy more than one, right? Not the cheapest cookies with $4 each, but they are totally worth it. Upgrade your nighttime campfire treats from their dessert bar. It’s fun exploring this new Town Center and all the unique restaurants it has to offer. We felt like kids again with wide eyes at the candy store when we saw their dessert bar with so many different sweets to pick from. As soon as you bite into this glories creation you realize how rich and thick it is. It’s a compact brownie so thick in flavor it’s like eating several brownies in one all covered with a thick gooey layer of chocolate and topped with yummy S’Mores. Every bite is like pure heaven, it may look small, but its a dessert with a flavor far larger than its size. Cheap nom too for just $4 you get far more flavor than your mouth can handle! Such a flavorsome dessert, it would make it an ideal way to end your Summer House Santa Monica nom nom adventure.